Melissa Thornton has built a business and sold merchandise by proving how much Milwaukeeans love their home town. Melissa Thornton, founder of MilwaukeeHome. 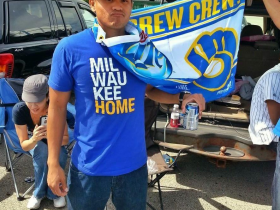 Chances are you’ve seen the familiar MilwaukeeHome brand on shirts, hats, and coffee mugs in shops across town. The logo, which splits Milwaukee into its three syllables, each with its own line and with home on the last line — is becoming one of the most recognizable and popular brands in the Milwaukee community. 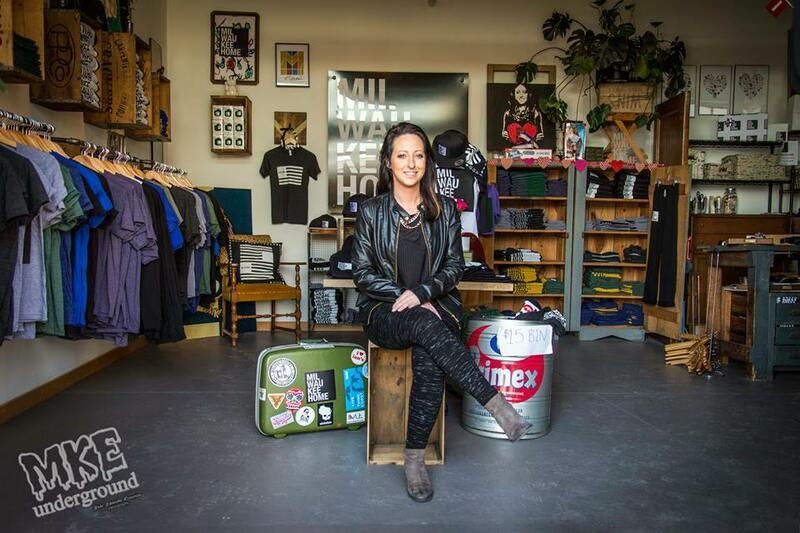 T-shirts, hoodies, mugs, koozies, and hats branded with the MilwaukeeHome have become a staple in gift shops and local retailers. MilwaukeeHome is still young, but in three short years Thornton has received more attention and support from the community and local businesses than she ever dreamed. In 2014 she partnered with the Milwaukee Bucks for a special promotion, designing limited-edition shirts and merchandise that featured the team’s logo. The same year she did a similar promotion for Summerfest, and in 2015 she’s partnering with the Milwaukee Symphony Orchestra on a promotional project. Thornton eventually left Wisconsin for work in Florida. She worked five years as an art consultant for Cult Branding, but after a bad breakup to a relationship and a death in the family, the need to come home really hit her. “This is where I belong,” Thornton says. 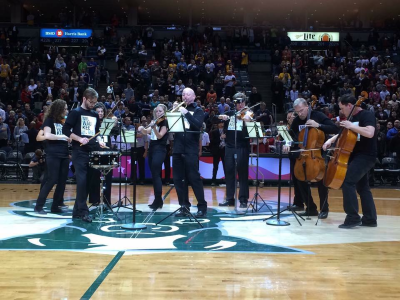 Members of the Milwaukee Symphony Orchestra sporting MilwaukeeHome apparel. Her friend loved the gift. As it turned out, he wasn’t the only one. People began approaching him on the street to ask where he had bought the hoodie. As a result, “I had ten shirts made and sold them out of a bin,” Thornton says. When those were gone, she had 50 more made. 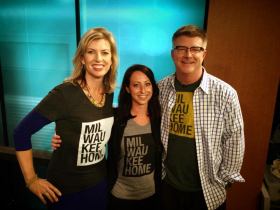 As the months went by, more and more people wanted MilwaukeeHome shirts of their own. Thornton began to see an opportunity to make her mark. Then came the “Aha!” moment. 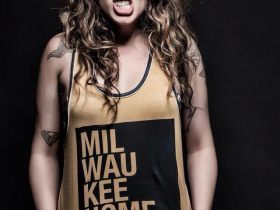 Sitting in her apartment one day, surrounded by boxes of shirts, she scribbled on a piece of paper “MilwaukeeHome = I Love New York.” The brand she created could become Milwaukee’s equivalent of the Big Apple’s iconic statement of city pride. Things have progressed in a whirlwind of activity since then. Thornton thought if she became successful enough, she could have her own store in four or five years. As it turned out, the MilwaukeeHome Store opened at its current location (159 N. Jackson St. Suit 101) in October 2012, only six months after she began selling the first shirts. You can find our coverage of the event here. Thornton credits the continuing popularity of MilwaukeeHome to the community and the people who love the city. It’s been nearly three years since MilwaukeeHome became a business – there’s a day-by-day countdown to the birthday party on the official Facebook, Twitter, and Instagram pages – and in that time Thornton has made connections with and gotten advice from many influential figures in the local and national arts communities. Wiskullsin creator Joey Wisniewski gave her advice on which festivals in the city to follow and to set up a booth. She has also created a mutually supportive relationship with the local music scene. Last year, thanks in part to crowdfunding, over 25 Milwaukee musicians got to showcase their talents at South By Southwest on the MilwaukeeHome stage in Austin, Texas. “One of the craziest things I’ve ever done,” Thornton says. MilwaukeeHome will be celebrating its third year in business on March 8. To celebrate and thank the community for its continued support, Thornton, 88Nine DJ Jordan “Madhatter” Lee, and six Milwaukee music acts will be hosting and performing at the Miramar Theatre from 5 pm to midnight. The event is as much a celebration of MilwaukeeHome’s continuing success as a thank you to the community that made it possible. For those looking to buy a MilwaukeeHome item, here is a list of retailers who sell them. This is a great profile on an awesome Milwaukee company. However, the numerous typos and misspellings make it less credible. You should proofread your content before posting it.